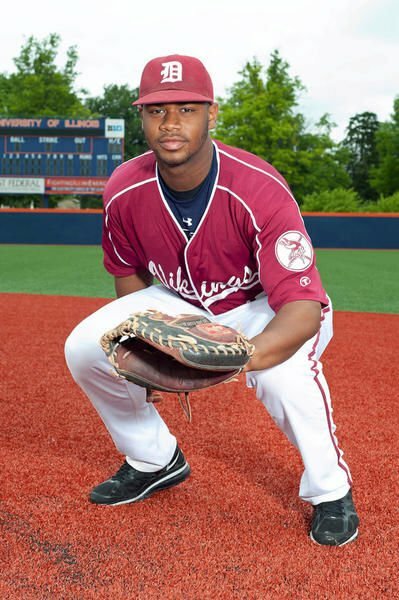 Bradley Leeb/The News-Gazette Danville's Chuckie Robinson poses for a portrait at the Illinois Field as part of the 2013 News-Gazette All-Area Baseball Team. Sunday, June 2, 2013. Robinson was a non-roster invitee to the Houston Astros spring training, where he hit one home run. Robinson spent the entire 2018 season with the Buies Creek Astros of the Class A-Advanced Carolina League. This is the first time that Robinson has been assigned to AA. AA is the second highest tier in the minor league system. Robinson had a batting average of .238 with 7 home runs and 30 RBIs in 75 games in 2018 for Buies Creek. Robinson is a former News-Gazette All-Area Player of the Year.